Akhilesh Yadav, former Uttar Pradesh chief minister and Samajwadi Party chief, today tweeted that he was “detained” at the Lucknow airport after he was stopped from boarding a special flight to Prayagraj city, 201 km from Lucknow. He was scheduled to attend a function of the Allahabad University Students’ Union this afternoon. Photos tweeted by Mr Yadav from the Lucknow airport show a police officer standing at the stairs of the aircraft, blocking the path to board. 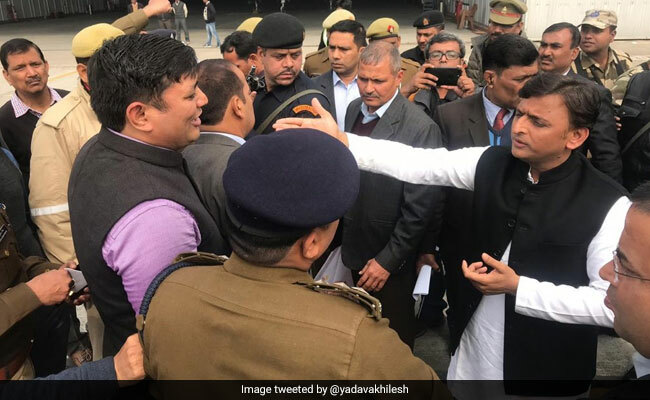 In another photograph , Akhilesh Yadav can be seen arguing with a police officer on the tarmac. A video put out by his media team show a man in civil clothes physically stopping him from entering Lucknow’s Chaudhary Charan Singh International Airport. An Mr Yadav can be heard shouting “haath mat lagao (take your hands off me) ” before a member of his security team pushed him aside. Sources told NDTV the man was an Uttar Pradesh government official. As the news spread, scores of his party workers and leaders rushed to the airport. Samajwadi Party’s student wing workers who protested in Prayagraj were baton-charged by the police. Dharmendra Yadav, a lawmaker, was injured in clashes with police after he tried to enter the university. “We will continue our protest till the UP government apologises,” senior Samajwadi Party leader and Akhilesh Yadav’s uncle Ram Gopal Yadav told NDTV. Bahujan Samaj Party chief Mayawati, who formed an alliance with Akhilesh Yadav for the national election, described the episode as “anti-democratic” and “an example of total dictatorship of BJP government”. “This is very unfortunate and this undemocratic step will be fought at all levels,” Ms Mayawati tweeted. “Is the BJP government at the Centre and in Uttar Pradesh so afraid of BSP-SP alliance that it is resorting to anti-democratic methods to curb our political activities,” she asked. In the last few days, students affiliated with the Akhil Bharatiya Vidyarthi Parishad(ABVP), the youth wing of the BJP’s ideological mentor Rashtriya Swayamsevak Sangh (RSS), have led protests at Allahabad University against Mr Yadav’s proposed visit to the university.